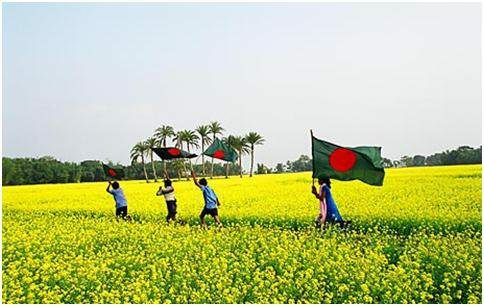 The peoples republic of Bangladesh is an independent country located in the north-eastern part of South Asia . The mountain Himalayas stand some distance from Bangladesh to the north, and in the south lays the Bay of Bengal. West Bengal province of India on the west and in the east lie the hilly & forested area of Tripura, Mizoram province of India and Myanmar. Total area of Bangladesh lying plain of about 1,47,570 sq. km (one lac forty seven thousand five hundred) criss-crossed by many rivers & streams. Big rivers are the Padma (Ganges in India), the Brahmaputra (Jamuna) & the Meghna and the Karnafuli. The capital is Dhaka. Bengali is the official language. 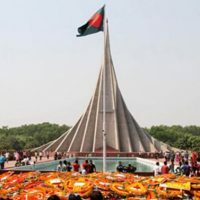 Because of political super power, economic discrimination, social life inspired the people of east Pakistan to prepared themselves to fight for a liberation war in the year 1971, the fight finished after 9 (Nine) months of bloody war and Pakistan surrendered to Freedom Fighters of Bangladesh, and her ally an Indian Brigade in Dhaka . 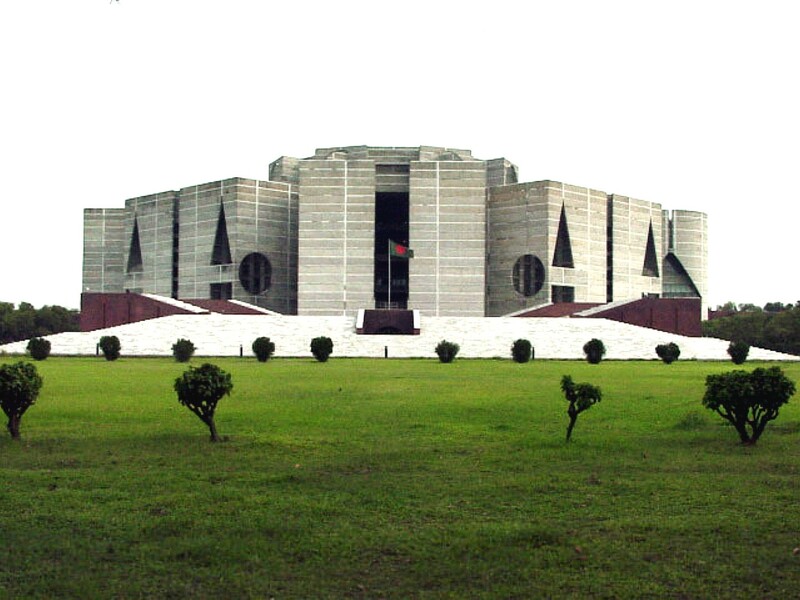 Bangladesh is a parliamentary democracy country with an elected parliament called the Jatiyo Sangshad (National Assembly). Bangladesh is the 9th most populous country and among the most densely populated countries in the world. Bangladesh is the fertile country because of Ganges-Brahmaputra Delta; on the other hand it is the main region of annual monsoon floods & cyclones. 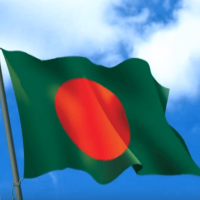 Bangladesh is a founding member of the South Asian Association for Regional Cooperation (SAARC), the D-8 and BIMSTEC, and a member of the Commonwealth of Nations , the Organization of Islamic Cooperation and the Non-Aligned Movement. The national language of the country is Bangla, also Bengali called by most nonnatives. Aroung 300 million people from Bangladesh; West-Bengal and Bihar and other Bengali speakers in other Indian states. The language starts before the birth of Christ. Bangla pronounciation varies by region to district, people of region may not understand clearly the language of a person from another district. This kind of area language called regional languaage. Formal language and common language use in school, college, university and other institutions as well as offices. Bangladesh is the 7th largest populous country of the world. Language: The national language is Bangla, which is spoken by 95%, 5% other dialects, English language is widely spoken in Bangladesh. Facts Crops: Paddy, Potato, Jute, Tea, Wheat, Sugarcane, etc. Rivers Facts: Padma, Brahmaputra, Karnaphuli, Meghna, Jamuna, Shitalakhya, Surman, Bariganga, Teesta, Dakatia, Arialkha, etc. Facts about Principal Exports: Raw Jute and products, Handicrafts, Tea, Leather and Leather goods, Garments, Frozen Shrimps, Hilsha Fish and Other fish, Ceramics, Vegetables, Software and IT Services, Medicine, Manpower, etc. Facts of Imports: Powder Milk, Food, Oil, Industrial Raw Materials, Machineries Parts, Chemical, Motor parts, Car and bus, heavy equipments, etc. Working Hours: The official working hours is from 9:00 AM to 5:00 PM on Sunday to Wednesday. Friday and Saturday is a weekly holiday. Banks transact their business from 9:00 AM to 4:00 PM on Sunday to Wednesday and from 9:00 AM to 12:00 noon on Saturday for few Banks. 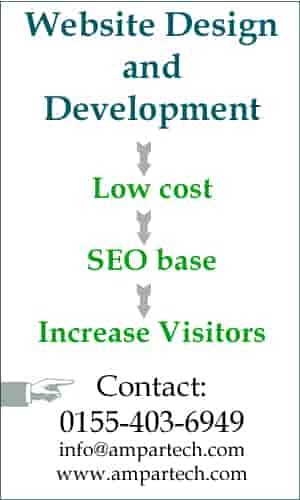 Facts of Industries: Jute, Garments, Tea, Fertilizer, Cement, Ship Building, Leather and Leather goods, Fishing, Food processing, Medicine, etc. Currency: Taka having a denomination of 1000, 500, 100, 20, 10, 5, 2 and 1. Facts Travel: This is a very beautiful country. Best time to visit this country is from October to March, there are many tourist spots. Ha-du-du is the national game of the country but people like cricket very much. Excellent hospitality. Guest cannot leave relative house without taking any food. Guest also should bring some fruits, sweets for the host. Manpower is the second foreign currency earning resource of the country as many Bangladeshi working in Middle East and other countries. 80% people of Bangladesh are farmers but main foreign currency earning product is garments. Micro-credit founder Dr. Muhammad Yunus from Bangladesh winner of Nobel Peace Prize, not for Economy. People of Bangladesh enjoy 6 seasons summer, rainy, autumn, cool, Winter and Spring; not like other country so hot or so cold. World longest sea beach is Cox’s Bazar in Bangladesh. Sundarbans is the largest mangroves forest of the World. 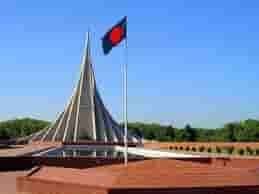 Language Martyrs’ Day 21 February is the International Mother Language day. Women wearing colorful Sharee or Salowar – Kamiz and men wearing lungee or pant and shirt. Mobile phone subscribers is 113.784 million. National symbols are from our natural presence. All national symbol are known to people and available every where of the country, the categories like Bird, flower, Fish, Animal, Fruit, sports, etc. Symbol is designed with the respect of national resources exist in the country. Hilsha is national fish of the country. Hilsha is locally known as Ilish. The Hilsha is very testy fish and font to every people. It is found in Padma, Meghna, Jamuna, Karnafully. It also available in China Sea, Arabian Sea, Red Sea, Persian Gulf, Vietnam Sea and Bay of Bengal. Water Lily is designed to National flower of the country. Water Lily Bangla meaning is “”Shapla”. There are two colors of Shapla are found in the country like blue variety and white variety. It is found in the monsoon season in low land area water. Magpie Robin is the National Bird. Its Black-White color is looking very beautiful. The bird is available every district of the country. Magpie Robin is prohibited to hunt or eat. Jackfruit is large and juicy fruit. Jackfruit is national fruit of the country. Jackfruit is found almost every district. Jackfruit’s Bangla word is “Kathal”. Its juicy pulp is tested and seed also can be used to make traditional curry. Bangladesh national animal is Royal Bengal Tiger. Once the tigers were found every forest of Bangladesh but now only in sundarbans. This tiger also available in China, Nepal, Bhutan, Myanmar, Combodea, Malysia, Thailand and Vietnam. National game of Bangladesh is Kabaddi. Kabaddi is a popular sport in the village. Kabaddi is know as ha-du-du in many regions. The game is played in Bangladesh, India, Nepal, and Pakistan as national level competition. Bangla Shon means Bangla Year is a traditional calendar of Bangladesh, It is also used in West Bengal, Tripura and Assam states of India. Bangla calendar introduced by Mughal Emperor Akbar. Bangla New year Pohela Boishakh starts on April 14 of every year.